Strips of leather intersect to form an X across the instep, with an adjustable closure around ankle. 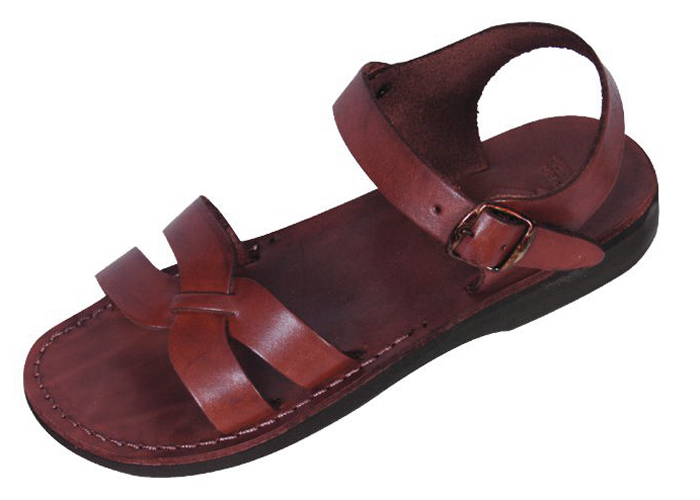 These biblical-style sandals are handmade made from 100% genuine leather. The David leather biblical sandal features two strips of leather that cross over the instep in an X pattern. across the top of the instep and an adjustable ankle strap closure. Camel Sandals' original biblical sandals are a perennial favorite that never go out of style! Sandals similar to these have been found at archeological sites dating back 2000 years or more. These classic handmade leather sandals are comfortable for any kind of wear. These biblical sandals are well-built to last for years. All the leather sandals in Camel's collection feature thick, resilient leather uppers and molded arch supports for comfort and quality finish. The sandals are handmade in the Holy Land by skilled craftsmen. The uppers are hand-glued and stitched to natural rubber soles. All models can be made in men's, women's, and children's sizes. NEW STYLE - May take up to 15 days to hand make.